The World Cancer Research Fund has produced recommendations to reduce your risk of cancer. These findings are the outcome of 7 years of research looking at over 3000 studies to produce the most comprehensive report on lifestyle and cancer called the Expert Report1. These recommendations are also advised to prevent.. It was a busy week in the media with many news reports in connection with National Obesity Week. With all the media hype about obesity I felt the real issues were overshadowed by the sugar debate. On one side of the debate is the new health lobby “Action on Sugar” which..
Consume 100kcals less! It’s achievable, realistic and will SAVE you money. Weight gain is caused by eating more calories than you are burning off. It is a fine balance. Try not to fool yourself otherwise. 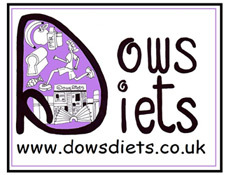 If you are gaining weight, you are taking in more calories than you are burning..
Dows Diets is one year old today! Wow, what a year. Dows Diets has been 15 years in the making. Lack of courage and need for financial security has always stopped me. Moving to do freelance work was always a distant dream. That was until last year. Redundancy presented itself..
Diary of a Wimpy Dietitian on the Cambridge Diet! Low calorie diets using shakes for breakfast, lunch and tea are the most effective form of weight loss after bariatric surgery for people with a lot of weight to lose. Effective yes, but is it realistic to follow? This dietitian decided to give it a go! Read on to find.. Many packed lunches are high in sugar, fat and salt. Only 1% would meet the nutritional standards that now apply to school meals. This months blog provides information on why its important to provide healthier options for your childs lunch box. Read on to discover what foods you can eat! ..
Pet Support An article this week outlined that nearly 9 out of 10 pets were at risk of an early death as a result of their diet. Poor diets, coupled with a lack of exercise is putting our pets at risk of obesity related illnesses such as arthritis, diabetes and..
11 to 17th March is Salt Awareness Week. There have been several features in the news this week about the amount of salt in our food and the need to reduce this for our health. A high intake of salt increases our blood pressure and increases the risk of cardiovascular..